We are into our last week of #bundleupyeg! As of this morning, we sit at 426 bags of clothing collected and delivered to Edmonton homeless shelters since Nov.1. Our original goal was 130 bags! Today, we are expecting to bring around 35-40 bags to the Mustard Seed. With five days left to go, we are busy bees this week collecting various boxes being hosted at private businesses and continuing to get pickups requests! Thank you so much to everyone who continues to donate and help keep folks in need warm. This year’s campaign has far exceeded our expectations and goals! I’d like to especially thank donor Edie Walker. Edie has been donating to us since year one (2013). This year, with the help of her husband Ron and her friends at the United Church Thrift Store (pictured top right below) she brought in 36 huge bags of donations! 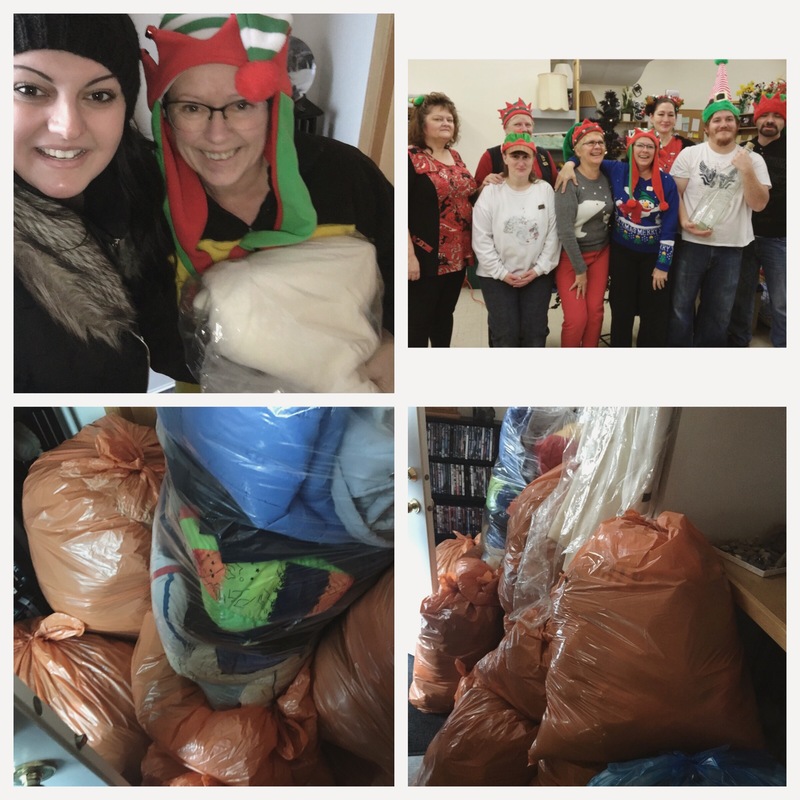 Yesterday we picked up the last donation haul from her for this year’s campaign – a total of 16 bags that were so full they took up her entire front doorway (bottom photos)! Thanks for all you do Edie, we are so grateful to have your support. Donations can be dropped off at Kingsway Mall in the Holiday Lounge until Friday. The box at Blitz Conditioning will end tommorrow. Let’s end this last week off strong!